Samgiita means the combination of vocal music, instrumental music, and dance. Prabhat was the given name of the composer of these songs, so the school of music that these songs embody has been named Prabhát Samgiita. The word prabháta also means “dawn.” Prabhát Samgiita heralds the dawn of a new era of music. The composer, Shrii Prabhat Ranjan Sarkar, initiated this school of music (gharana) in Deoghar, in the eastern Indian state of Bihar, on September 14, 1982, in the sixty-first year of his life. By October 21, 1990, the day of his departure from this world, he had completed 5018 songs, a number surpassing that of any known composer before him. Yet so effortless was the creative flow in his mind, that the composition of all these songs occupied a minimal amount of time in an extremely full life, a life of intense organizational activity as president of Ananda Marga. 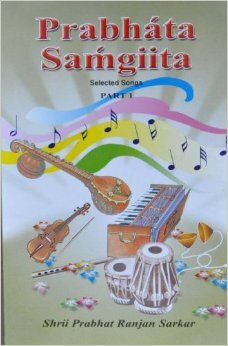 Prabhát Samgiita includes songs for every spiritual or mystic mood and songs for many social occasions. This volume presents the lyrics of the first 200 songs with their English translations. They are mostly in Bengali, but in other languages as well.